This 2 to 2.5 hour class will teach you rules of gun safety, how to operate a revolver or semi-automatic pistol, shooting positions, fundamentals of accurate shooting, and recognizing/clearing malfunctions. Students will learn how to safely operate a pistol at closer ranges and participate in fundamentals practice shooting. Students need a pistol of .22LR caliber or greater and 100 rounds of brass cased target ammunition (no steel core ammunition); minimum of one magazine, ear protection & eye protection. It is highly recommended that beginners shoot a pistol of no more than 9mm caliber. Students need ear and eye protection and prescriptions glasses are acceptable. Pistols can be rented from the range. This is not a NRA certified class. Pre-register and pay at least two days in advance of class. If you are the only registration we will still take you as a private student if you pay an additional $65, or if only two students register you could pay an additional $15 for a semi-private class. This is less than our normal private instruction rates of $60 per hour with a two hour minimum plus a range fee. If we have to cancel the class your full payment will be refunded. Last minute registrations taken if three people have pre-registered. Payment with your registration is required to reserve a slot for a class. If you cancel attending more than 48 hours prior to the scheduled start time of a class you’ve registered for there will be a $50 cancellation fee deducted from your pre-payment to cover our advance administrative costs. No refunds are given if you do not cancel at least 48 hours in advance or you do not show up for the class. Looking for a Basic Pistol Fundamentals Course in The Woodlands, Conroe, Spring, Montgomery, Tomball, or greater Houston area? We’re glad you found us! 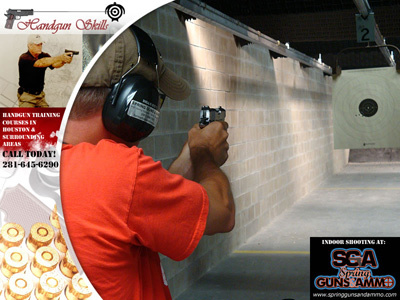 Give Handgun Skills a call today 281-645-6290.